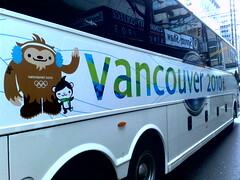 With only a few days left before the 2010 Olympic Games officially begins, there is a buzz around the streets of Vancouver. Being a resident of the city, I can certainly say it has undergone some radical changes in the past few months. Regardless of whether or not you support the games, it seems everyone has something to say. Recent talk has surrounded the issue of sustainability. Considering, at the very least, the carbon emissions created by all the flights into the host city (and some residentsâ€™ flights out of the city) the Olympics can never be genuinely environmentally-friendly. However, Vancouver 2010 has been promoted as â€œthe greenest Olympics everâ€ (official website: http://www.vancouver2010.com/sustainability/). Interestingly, David Suzuki recently awarded Vancouver 2010 a bronze medal for sustainability (full article: http://www.davidsuzuki.org/latestnews/dsfnews02031001.asp). He writes: â€œachievements of the 2010 Olympics include building energy-efficient venues, using clean-energy sources, relying on public transit during the Games, and offsetting part of the Gamesâ€™ emissions.â€ However, several areas were lacking. For example, the David Suzuki Foundation admits that â€œopportunities to create lasting reductions in transportation emissions in the region have been missed.â€ In addition, the carbon-offsetting accounted for less than half of the overall emissions. Are the 2010 Olympics green? Yes, but only because thereâ€™s no snow! Which raises the first major point. Vancouver is mild, sunny, and snow-free, which has Olympic officials incredibly worried. What has everyone most concerned is the lack of snow at Cypress mountain, where major events will be held. The solution? Instead of switching locations to snow-filled Whistler, trucks have been transporting snow three hoursâ€”from Manning Park all the way to Cypress, using fossil fuels and emitting greenhouse gases. Around the city, road closures and detours have also created traffic havoc, thereby increasing greenhouse gases. An equally controversial topic is the famous red Olympic $10 mittens. They are marketed as the must-have souvenir for the games and it seems every second Vancouver resident on the street is wearing them. Ironically, the mittens are made in China. This has been argued by some as trivial and irrelevant, but as such a prominent icon of the (â€œgreenâ€) Olympics, the symbolic importance of this hypocrisy should not be ignored. Profit is certainly more important than sustainability, as countless other souvenirs (made around the world and shipped to Vancouver) are also ready on the shelves to be consumed. Finally, as if Christmas lights donâ€™t create enough controversy, many Vancouver residents have been encouraged by VANOC to â€œPaint the Town Redâ€ by decorating their houses with red and white lights, using more electricity. As climate change continues to become a more and more pressing issue, itâ€™s crucial that long-term, legitimate measures be taken on the part of organizations like the Olympic Committees. Greenwashing wonâ€™t cut it. After all, the Winter Olympics just wouldnâ€™t be the same without, well, winter. I'm also skeptical about the greenness of the Olympics... If you get a chance, check out my blog about Olympic sustainability and let me know what you think! It would have been nice if they had made a bigger deal about it being a "green" olympics. I did not notice anything really nor did they speak on green topics very much. They're actually promoting the "green" aspect of the Olympics quite a lot. Some of their key points being that they use mostly non-polluting energy, they finance eco NGOs, they encourage legal steroids for non-professional use, and they recently ran a Recycling campaign.